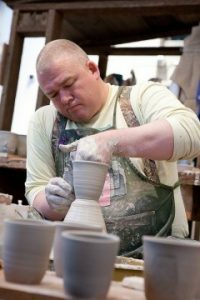 A marine veteran of the 1991 Gulf War, Ehren has turned to pottery to discuss heavy issues; his goal is to start a dialog with different communities using art as a conduit. He will be demonstrating in Lyon Park from 12 – 5pm and then give a slide lecture of his own experiences at 6pm at Clay Art Center (40 Beech Street, Port Chester, NY). His work is currently in the gallery exhibit “US” through September 15th.